Just checked JR.com this morning to see if they are running any sales (the Ectaco jetBook Lite is down to $99 again) and they now have the Kindle DX listed with all the other ebook readers. It is not sold online, just at J&R retail locations which are located in New York. This a somewhat perplexing as the Kindle is known for only being sold from Amazon and Target retail stores; you’d think they would’ve made some kind of announcement. Regardless, it provides a good opportunity to check out the new higher contrast screen in person for those that live near a J&R retail store. Even though it would cost extra to buy in store with sales tax applied, any additional retail presence benefits Amazon in the long run. Most people are still unfamiliar with ebook readers and being able to see the Kindle DX in store and get a first hand look at how it works is a major positive. It stands to reason that J&R will also start carrying the new Kindle 3 in retail stores once it is officially released at the end of August. Given J&R’s limited retail presence, you’d think Amazon would try and get the Kindle in larger chain stores like Best Buy. 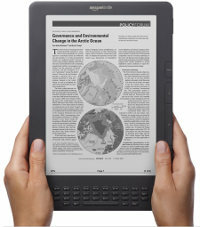 That would put Kindle on the shelf right next to the Nook and Sony readers. But I guess Amazon only partners with companies that are in the Amazon Marketplace—not surprising, really.